The Portuguese filmmaker Goncalo Tocha's "It's the Earth Not the Moon" begins with nothing visible but water, the prow of a boat and, in the distance, the hazy outline of what might be an island. 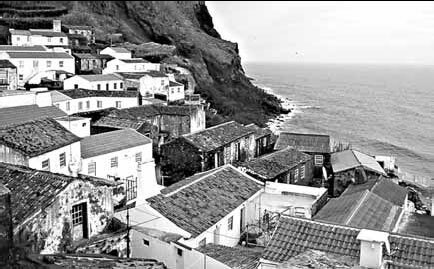 The boat is carrying Mr. Tocha to Corvo, the farthest and smallest outcropping of the Azores archipelago, in the mid-Atlantic nearly 1,500 kilometers from the Portuguese mainland. "Azores, it's crazy," the boat captain says. "And there, it's even crazier." For the next three hours the film, which has won various awards, immerses the viewer in that tiny (18 square kilometers) and remarkable place, home to fewer than 500. Mr. Tocha tries to show us all there is to know about Corvo, which he calls "the end - after that you cannot go anywhere else." Through Mr. Tocha's lens, Corvo is a place where premodern rituals of harvest and slaughter coexist with disco balls and a contentious, media-saturated local election. Old men who still herd cattle near 600-meter cliffs recall the days when a rocket signaled that whales had been spotted, and they would race down to the oceans to grab harpoons. "I call it a travel adventure film," Mr. Tocha said by phone from northern Portugal of "It's the Earth Not the Moon" ("E na Terra Nao E na Lua"). "It's like the book of an explorer who goes to a place and makes a journal or diary of discovering." There is a literary, antique quality to "It's the Earth." But it also feels completely modern. "I went with no previous idea of what I'm trying to do," said Mr. Tocha, 33. "The kind of film it will be I didn't have any clue." "It's the Earth," Mr. Tocha's second feature, grew out of his first, "Balaou," which focused on a boat trip he took to Lisbon after the death of his mother, who came from the islands. "Every year I went to the Azores, it was this childhood dream of the nature and the ocean," he said. "It's the Earth" shows the island's absurdly dramatic landscape from every vantage point: atop its cliffs, across its small pastures, inside the gently eerie caldera of an extinct volcano. "Corvo is really difficult to film, to get people to speak," Mr. Tocha said. "They are suspicious of what the image can do. They're very proud." It took his two-man crew two years of filming to win the islanders' trust. The results were 180 hours of film and a rapport that's evident on screen, as Mr. Tocha and his sound man film islanders, residents of a neat little port that dates to the 16th century, going about their business: farming, fishing, picking up provisions or staring at the sea. The young people were most resistant to appearing. "Actually I liked that - they are the generation that doesn't speak, and in 20 years they will be running Corvo," Mr. Tocha said. In the rhythm of the islands he finds an analogue for his own methods. "They have this thing of looking at things for a long time, just stopping their action and starting to look - it can be to the ocean, to a cow, to the landscape," he said. "I don't know what happens in their minds. But it's like a long shot, a shot that starts and ends itself, and I don't have to cut it. That's why I love to make films in the Azores." Long a symbol of isolation, Corvo has changed radically as transportation has improved over the last 50 years, and the changes will only accelerate. "Everything that's happening everywhere in Western society is happening in this island, but it's happening for the first time," Mr. Tocha said. "It's a laboratory of human life."